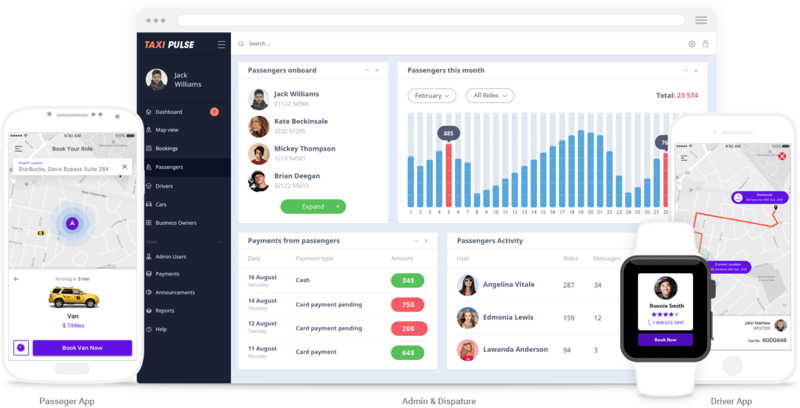 If you need more features, enhancements, and integrations in your taxi solution, we can do it for you at a very competitive price. Our taxi solution works globally with built-in support for multiple languages and currencies and a robust choice of payment gateways to start accepting payments anywhere seamlessly. Check out all the options. Q. How do I get started with your taxi solution plan? Actually, it is quite simple. Once you decide to go for the monthly subscription plan, just send us an inquiry through the contact form. Our taxi solution experts will immediately get it touch with you and start the onboarding process for your business. You will be up and running with your branded taxi dispatch system and apps in a few weeks time. Q. What level of branding do can I get from your solution? As part of the monthly subscription plan, we will provide you white label and fully native passenger and driver apps with your own branding and logo. The admin panel will also carry your branding. In case you have additional branding needs, we can do it at a very nominal price. What you see is what you get. The taxi app development cost includes everything that is Make this chnage and then publish the chnages on live. Q. How long will it take to implement the solution for my taxi business? Well, we can provide a completely white label taxi solution in a few weeks time. For a more accurate timeline, feel free to talk to our taxi solution experts. Q. Do I need additional hardware? We will do an on-premise server setup for you (cost is covered in the plan). Besides that, you need absolutely nothing. Passengers and drivers can install the respective apps on their personal mobile devices and you as the business owner/admin can manage your entire taxi business from a powerful yet easy to use web-based admin panel that is accessible from any modern browser. Q. Are the passenger and driver apps fully native for both Android and iOS? Absolutely. Both your customers and drivers get a fluid mobile app experience on both Android and iOS devices. Q. What if I need additional features that are not included in the monthly subscription plan you have mentioned above? We are experts at providing custom taxi app development solutions to our startup and taxi business clients (20+ happy clients and growing fast). The subscription plan covers most of the basic features that a typical taxi business would need. Still, if you have additional requirements for new features, enhancements, business logic changes and custom integrations, we can confidently do that for you at a custom taxi app development cost structure. Q. What if I need additional payment gateway integration? No problems here as well. Just let us know where you want to start accepting local payments and we will integrate the most suitable payment gateway in the solution. Additional payment gateways will incur an additional charge besides the basic taxi app development cost. Q. What if I don’t want to pay the initial setup fee? We have good news for you. Based on the number of drivers in your network, we can completely waive off the setup fee that is usually chargeable as part of the plan. Contact our taxi solution experts for more details on this. Q. Can I get a better monthly price per driver? Yes, you can. Just like the setup fees, we are ready to offer a better pricing based on the number of drivers.